What is Islamic Art? Well, the best place to find the answer to that question is to head down to the Islamic Arts Museum in Kuala Lumpur. Islam is the main religion of this nation and so it is only so that the gallery showcases the history of how Islam has grown in the nation. The gallery seeks to showcase works of art and artifacts that tell the story of how Islam has evolved and how it entered the nation back then. 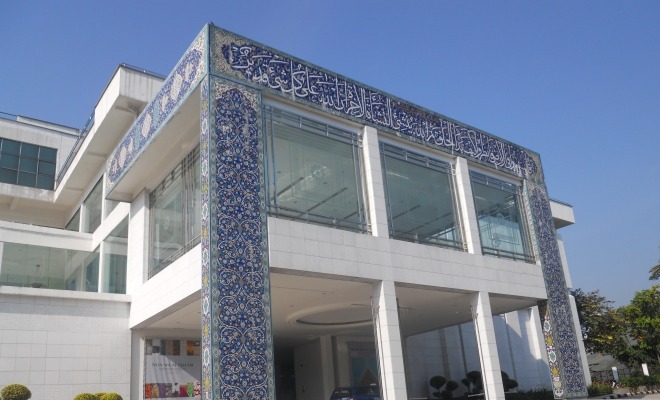 The permanent exhibition gallery has on display three mini galleries that will take you through the history of the nation’s heritage of Islam. Here, you will learn how Islam has expanded its borders. You can see pictures of people discussing Islam or Quran Manuscripts and replicas of certain artifacts and architectures. Jewellery is also available on display here at the Islamic Arts Museum. One interesting display is how the museum explains the diversity of the Islamic people in Malaysia during the olden days. One highlight during your visit to the Islamic Arts Museum is the opportunity to see first-hand the interior of an Ottoman Syrian room from the early 1800s AD. You can also view the woodwork, arms and armors, glass and ceramics and the metalwork of the Muslim people during the olden days. The displays are certainly unique and interesting in their own way. Also on display are some coins dating back older than a century. Another interesting highlight that is a must-see in the museum is the Islamic fashion that in the olden days spoke of the wealth and status of an individual. The clothes and textile one wore was very important and the finest of these textiles was a luxury that only the elite could afford to own. Well, today these fine textiles are on display at the Islamic Arts Museum and showcase the beauty of the colorfast dyes that were used to make the beautifully woven clothes that they wore in the olden days. It certainly is a beautiful insight into the history of their world. War was also a part of the Islamic world. There were many battles that they faced when dominating the world with their teachings but they also put into consideration the effort to make their tools of war beautiful. Their weapons were always in scripted with religious verses and sayings. Steel was the popular choice for their weapons that had more carbon to make their weapons longer lasting and stronger ones. Diamonds, rubies and pearls which were favored by the more upper class of the Islamic society are also put on display here. There also are the toe and nose rings here which symbolize status and creed. Being located strategically in the middle of the fastest trading route back in those days, Malaya was one of the earliest to receive the teachings of Islam. Thus, there are today many artifacts of craftsmanship of different materials that have ended up here in the museum. Once you have completed the entire tour of the museum, do visit the museum shop for interesting gifts and souvenirs like plates, tiles and even mugs to remind you of your visit to the museum.